Approximately 100,000 deaths are attributed to malaria yearly in Tanzania –about 80,000 of these deaths are among children under-five. The total Tanzanian population at risk from malaria amounts to nearly 35 million. Young children and pregnant women bear by far the highest risk of dying from malaria. It is estimated that 4% of this risk population, 1.4 million, are pregnant women and that there are approximately 6.4 million under-five children in Tanzania. A national coordination unit (ITN cell) within the National Malaria Control Programme, supported by the Swiss Agency for Development and Cooperation (SDC) and implemented by the Swiss Tropical Institute (STI). The Tanzania National Voucher Scheme (TNVS) aiming to provide every pregnant woman and every infant coming for measles vaccination with a voucher worth, in Tanzanian Shillings , TZS 3,250 (US$ 2.85) that can be redeemed against a bundled polyester net at a shop of a participating retailers. The women pay a top-up contribution which in 2005 averaged around TZS 1,000 (US$ 0.88). By 2007, the top-up had risen in line with petro-chemical prices to about TZS 1,600 (US$ 1.40). The idea of giving women a voucher rather than a highly subsidised net is two-fold: (1) that it leaves the trouble of ITN distribution entirely to the commercial sector, and (2) that it stimulates strongly the development of the commercial net sector, which can then also cater for non-target groups and provide a sustainable distribution mechanism. Support comes from the Global Fund to fight AIDS, TB and Malaria (GFATM) and the US President’s Malaria Initiative (PMI). Most TNVS activities are sub-contracted to implementing partners such as Mennonite Economic Development Assistance (MEDA) for the logistics of the vouchers. The free-of-charge provision of insecticide treatment kits for bundling with all polyester nets manufactured and sold in Tanzania, the marketing of subsidised, stand-alone re-treatment kits and the facilitation of LLIN technology transfer to the Tanzanian net manufacturers. These activities are financed currently by the PMI and the Royal Netherlands Embassy (RNE). Demand creation and Behaviour Change Communication. Two complementary programmes have now replaced the successful SMARTNETS social marketing programme (2002-2007). The COMMIT programme supported by the PMI and implemented by a consortium led by the Johns Hopkins Bloomberg School of Public Health Center for Communication Programs, and the GFATM-supported Behaviour Change Communication programme implemented by Population Services International (PSI). Catch-up: Since coverage of risk groups increased too slowly under the voucher scheme, NATNETS will conduct a mass ‘catch-up’ distribution campaign to provide free LLINs to all 6.4 million children under five years of age. This will be co-funded by the GFATM, the World Bank and the PMI. Re-treatment: At the same time as the ‘catch-up’ campaign, a National Net Re-treatment Campaign will be carried out to re-treat approximately 6.5 million polyester nets with support from the World Bank. In the first four components, impressive results had been achieved: four manufacturers in Tanzania launched large bednet production programmes, some of them becoming significant exporters. 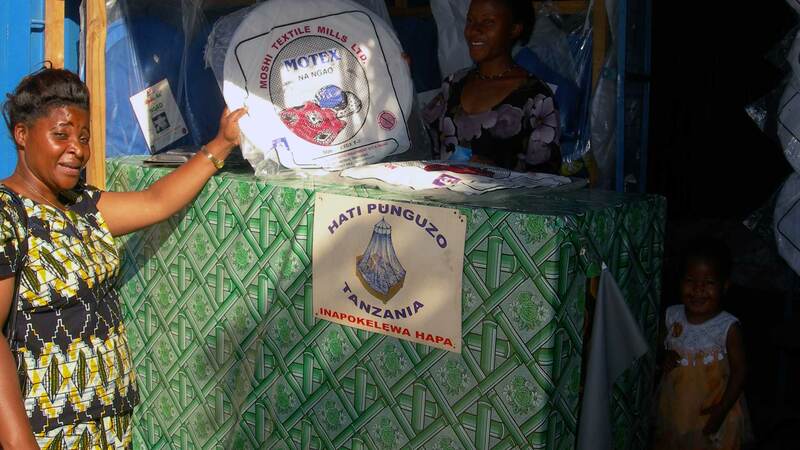 Over 6,400 retail outlets are now selling almost three million bednets per annum (compared with 1.1 million in 2001). Some 13.1 million bednets and 12.5 million re-treatments have been delivered from 2002 to 2007. Some 2.96 million nets were sold or distributed in 2007 alone, at prices ranging from TZS 2,000 (US$ 1.75) to TZS 8,000 (US$ 7) depending on type, size and material. Importantly, a true culture of bednet use has been introduced into the country, putting future programmes on a strong basis.